A powerful mouse is shaking up the way movies and TV shows are paid for as the worlds of technology and television continue to collide. Disney’s $52.2 billion deal to acquire 20th Century Fox, which is expected to close in mid-2018, is a sign of how seriously the established media is taking the rise and dominance of video-on-demand streaming platforms. The move will bolster Disney's back-catalogue of classics while also adding to its pipeline of future productions as it moves to create its own standalone streaming platforms, part of a trend that is changing the face of US TV viewing. There are signs that all major US TV networks are likely to have launched standalone direct-to-consumer streaming services by 2022, going head-to-head with streaming platforms, according to a report from research company The Diffusion Group (TDG). And Disney is one of the biggest players spearheading this move. Disney is slated to launch its own TV distribution channels, known as “over-the-top” (OTT) services, that aim to actively cut out digital-first streaming providers. Disney made this clear when it announced last year that it is pulling its content from Netflix in 2019. It is choosing to end its partnership with the streaming platform in favour of launching own-brand streaming services. Disney’s ESPN+ sports OTT channel has already been teased for launch in late March or early April 2018. Traditionally, TV shows have been partly funded by affiliate fees – sums paid by distributors to studios for broadcasting their content. So, for example, subscribers to cable channel TNT each contribute about $2 a month to Disney's coffers, while overall affiliate fees are estimated to be worth billions of dollars a year to the company. However, this model has been upset by the arrival of digital-first streaming platforms like Netflix, which provide unbundled, on-demand content to viewers for cheaper rates, about $7-$11 a month compared to $60-$100 or more for a monthly pay-TV subscription. Platforms like Netflix and Amazon's video are splintering audiences, which poses a risk to traditional broadcasters' advertising revenues, which are based on viewing figures. Instead of viewers paying for bundled programmes, many of which they might not want, they can simply pay to watch those they do. Viewers now have the freedom to abandon traditional TV distributors redirecting their loyalty from networks and studios to streaming platforms. Disney's decision to invest in its own streaming services, has the potential to generate larger income per customer by cutting out the middlemen and going direct to customers, as it is doing with its co-owned ESPN sports network, which brings in $7.54 per subscriber every month. Disney’s affiliate fees for 2017. Disney isn't the only traditional TV network to wake up to a changing media landscape. Other companies that have introduced streaming services include Starz, Showtime and CBS. Earlier this year, Les Moonves, chief executive of CBS, said the company’s two direct-to-consumer channels, CBS All Access and Showtime, which launched in 2017, already have nearly 5 million subscribers. HBO, a US cable channel known for original drama series, including the acclaimed multi-Emmy-Award-winning Game of Thrones, announced its own direct-to-consumer offering in 2014. Sporting bodies are also adopting the OTT model. Formula One racing, for example, has announced a streaming subscription service for the US and Europe. Meanwhile, Discovery’s recent $14.6 billion acquisition of Scripps Networks Interactive has created the industry’s largest group of lifestyle, factual and unscripted entertainment cable channels. This includes Scripps’ Food Network, HGTV and Travel Channel, which will merge with Discovery, TLC and Animal Planet. The combined offering will represent a nearly 20% share of ad-supported pay-TV audiences in the US, Discovery said. The company is actively looking at developing an OTT offering, either alone or with partners. These trends indicate that legacy media companies and television networks are making assertive moves to take back control from newer kids on the block, but it won't be an easy battle to win. 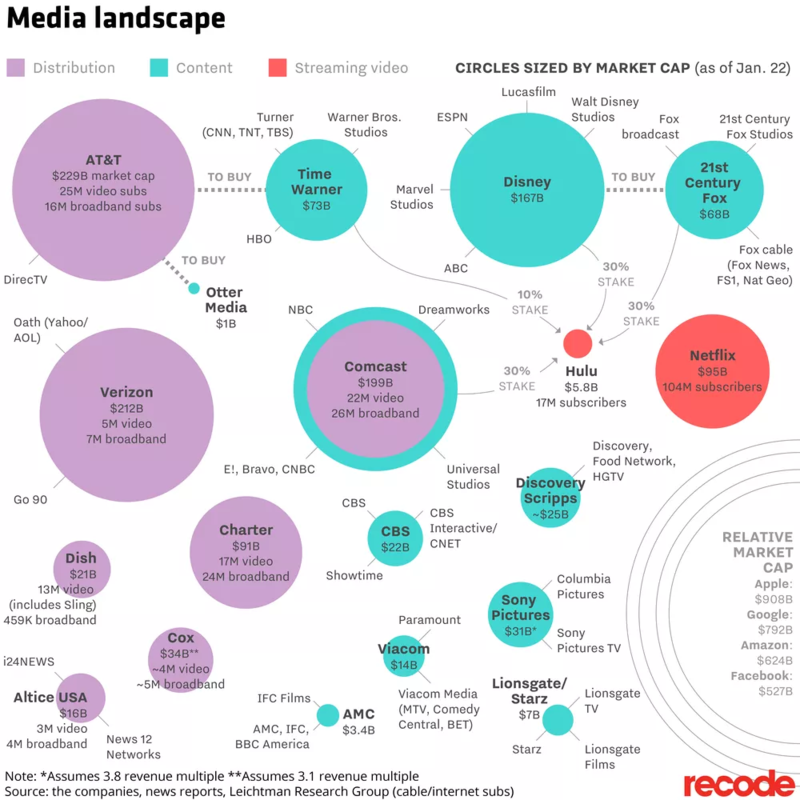 These are the companies who own the most in Big Media today. Ever nimble when it comes to innovation and disruption, Netflix and Amazon took steps to keep their audiences by investing in the production of original series and films. The success of these award-winning productions, like Netflix's US remake of UK political drama House of Cards and Amazon's The Marvelous Mrs Maisel, is testament to the ongoing disruptive impact of streaming platforms. 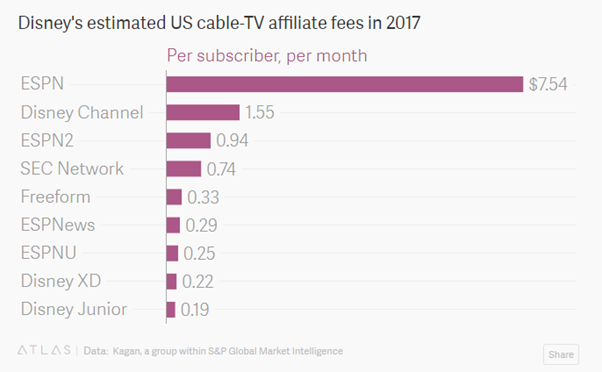 They have grown their subscriber bases while diverting audiences away from traditional networks, cable and satellite companies. For US customers who have been “cutting the cord” by abandoning pay-TV subscriptions, OTT means they can buy the programmes they want without having to pay for bundled shows they do not. It's not yet clear, however, whether consumers who are used to packaged deals of sports, films and news services, will want to pay for lots of different subscriptions when they are used to buying just one. But there are indications many already pay for OTT services as well as pay-TV packages. Price points are likely to be key here, as will ease of managing subscriptions. The disruption of the pay-TV ecosystem still presents traditional media companies with potential risks. Affiliate distributor fees make up a huge chunk of income that finances future studio projects. Disney, for example, posted $12.3 billion in affiliate revenues in 2016, according to Quartz. These included fees from broadcaster ABC’s local US stations and international cable channels. Media companies make their money from advertising, TV and video-on-demand services. Whether studios can attract enough subscribers and advertisers to their OTT services to maintain or grow revenues remains to be seen. Despite the risks, Disney is attempting to position its traditional family fare for 21st century audiences and prove that the House of Mouse is still mighty.